Because we are united in the bond of baptism, the sickness and suffering of one member of the Body of Christ touches all the others as well. No one is meant to suffer alone, without the support of a loving and caring faith community. Our Lady of the Lake has formed a group of ministers to the sick and suffering to help everyone attend to this important population — who remind us of the things that really matter. What is very important to note is that anointing of the sick is not the last point on this continuum. 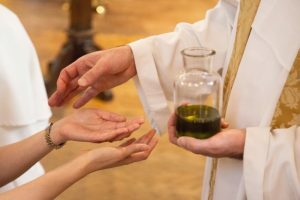 In other words, although commonly referred to as the “Last Rites,” it does not always come “last.” For this reason, the Church encourages people not to wait until someone is near death to request the sacrament of the anointing of the sick. Instead, when a person begins to be seriously ill, that is the time to request an anointing of the sick. This anointing can take place in the home of the sick person, at church during or after mass, in a hospital or nursing home. Because the sickness affects not just the sick person, but the whole family, it is usually a helpful thing to plan the anointing so that family and their friends can be present as well as the sick person. Twice a year, Our Lady of the Lake Parish celebrates communal anointing of the sick during all the masses on a given weekend. This gives all parishioners the opportunity to be directly involved in the ministry of prayer, caring and support for the sick of our community. Please note that if you are interested in being part of the parish ministry to the sick and suffering, contact Fr. Joe for further information.